This weekend I had the pleasure of doing a one day retreat with prisoners in northern Quebec, an experience that always seems to have a deep effect on me. I have always believed in the transformative power of meditation and have found that one of the places where it is most needed is in penitentiaries. Sometimes it takes the darkest places of human experience to really see what this practice can do. Many of you may be asking yourselves “What good can this do to people who may never be able to reintegrate into society, and for those who will, can this actually bring anything to them?”. I can say that this can have a positive impact on inmates and how they conduct themselves. 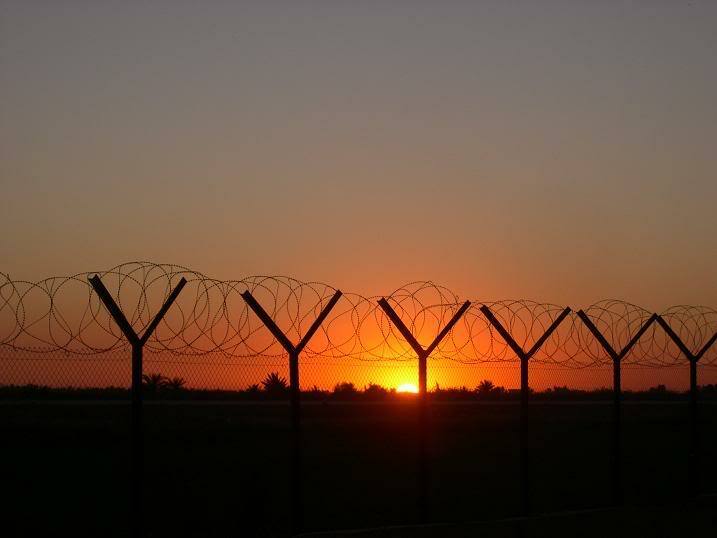 It has also been proven that inmates that develop a meditation practice while inside have a greater chance of not being incarcerated once they leave. I often get teary eyed when the inmates thank me for coming and showing that someone actually cares about them on the outside, the gratitude that they express is very touching and sincere. The inmates get to go through an extensive process of understanding how their childhood traumas and abuses shaped their past and the choices they made. The practice demands that they not only admit guilt to the crime that they came to prison for, but that they also hold themselves accountable for the impact that their crime had on their victims, on the victim’s families, on their own families, and on themselves. When one is meditating and looking inward, they are forced to look directly at their fears, ignorance, and how they have arrived to where they are in their lives now. Through this rigorous self-growth process, the inmates begin to understand how to recognize their own emotional states and how to take steps towards self-forgiveness. This step of self-forgiveness is crucial in being able to create an inner change that will bring them towards the freedom that we are all trying to achieve. I was able to witness this with certain inmates this weekend, they are working towards their self-forgiveness in the hopes of finding some freedom even though they are behind bars. 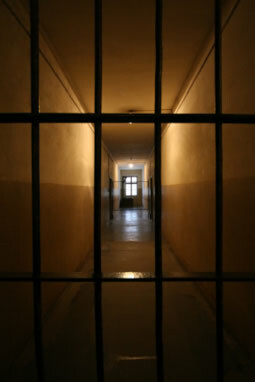 There is a program in the United States that takes this even further, the Insight Prison Project will eventually bring about a panel where the inmate will be able to meet the victim’s family to allow them to explain their past, how they feel about the crime that was committed and hopefully allow an open and honest dialogue. Forgiveness is not a requisite, but some of the victim’s family will be able to forgive once they were able to discuss with them. It is really inspiring to hear the inmates talk and witness with open hearts, many of them even talk about how they want to be able to get out to give back to society. The sense of service is very strong with them, a side-effect of compassion and the practice. The most common service among the inmates is working with youth to be able to help them not commit the same mistakes that they did in the past. Many of them will also tell me that if they had been exposed to this practice when they were thirteen, they would not be here today. I believe that people can and do change their lives for the better, this is most obvious and clear when I am inside different penitentiaries. It is really incredible how a solid and dedicated meditation can impact someone, it holds someone accountable for their crimes, and gives him the skills necessary to understand the choices he made, and how it teaches him the ability of witnessing himself so that he can make new and different choices now and in the future. These skills will be crucial for their re-integration back into society when they get out, something that is unfortunately not taught normally in penitentiaries.It is always hard to leave these men at the end of the day, or even the evening meditations that I do here also, I feel their open-heartedness, their willingness to learn and grow and change. I feel their sincerity and their love for each other and for me. There are so many broken lives – lives broken by poverty, drugs, despair, mental illness, and so on. I endeavor to be of service… to help bring opportunities for healing to more of these broken lives.When it was time for them to return to their quarters, the guard checked us out. I walked out to the car noticing how free I was to go where I pleased. I turned around and took one last look at the penitentiary. As I drive through the Laurentians, I think to myself, ‘I just shook hands and hugged men who have committed murder!’ I thought this more during my first visits inside a prison, but you know, not once do I think of those men as murderers when I am with them. All day long, I felt so connected with everyone at the heart level, and I appreciated our shared humanity. These experiences and days are one of the greatest gifts of the dharma for me, to share my humanity with people who have been put aside by most of society and forever judged, to simply realize that we are all human and striving for the same thing: freedom. What do you mean emptiness is a good thing? 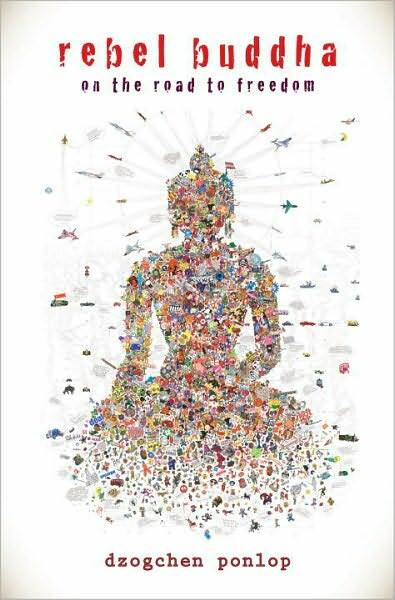 I am reading the Rebel Buddha right now, which is a great read if you haven’t checked it out yet, and something really stuck with me and that is the Buddhist teaching on emptiness (Sunyata). The teaching of emptiness is definitely one of the biggies, it is closely tied with the teaching of anatta, the teaching of impermanence is crucial in Buddhist teachings, but the term as such can be very confusing to our Western minds. 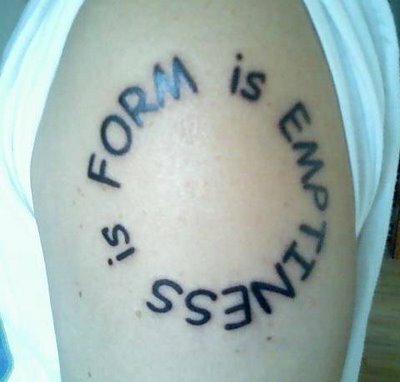 Usually emptiness or simply the term empty has a negative connotation, empty wallet, empty minded, etc. 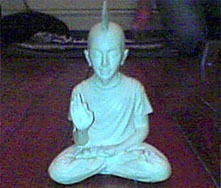 In Buddhism however, emptiness is actually full. Lets get into the nitty-gritty and see how this term can represent a fullness. In Buddhist teachings, emptiness is a characteristic of phenomena arising from the Buddha’s observation that nothing possesses an essential, enduring identity (anatta here kids). The realization of the emptiness of phenomena is an aspect of the cultivation of insight that leads to wisdom and inner peace. The importance of this insight is especially exposed in the Mahayana teachings, but it is also found in many other teachings, one of the biggest I would say is the Heart Sutta. Emptiness signifies that everything one encounters in life is empty of absolute identity, permanence, or an in-dwelling “self”. This is because everything is inter-related and mutually dependent – never wholly self-sufficient or independent. All dynamic things are in a state of constant flux where energy and information are forever flowing throughout the natural world giving rise to and themselves undergoing major transformations with the passage of time. 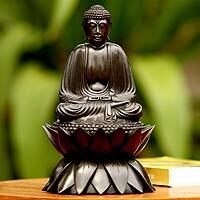 So the Buddhist concept of emptiness emerged from the doctrine of the nonexistence of self, and dependent arising. 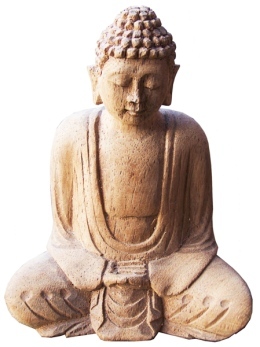 There can be some confusion when one begins to investigate this teaching, many different philosophical schools or tenet-systems have developed within Buddhism in an effort to explain the exact philosophical meaning of emptiness. Seeing as how I am coming from the Theravada tradition, I will expand on its understanding of emptiness, but check out the other school and systems and their take on emptiness. 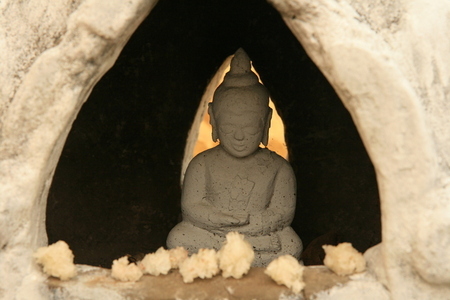 In the Parisambhidamagga, there are many meanings given to emptiness, including nirvana. Formations are said to be empty in, of and by their “own-nature”, this sounds a lot like the Mahayana understanding. 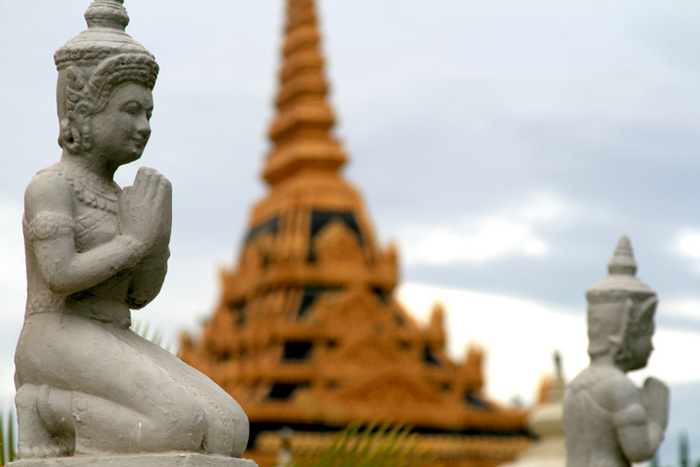 Emptiness, however, is not taught as much by Theravada teachers as their Mahayana colleagues. One of the main reasons for this difference is that emptiness is seen as a liberating insight in the Theravada tradition, instead of a philosophical concept that must be intellectually understood; usually emptiness is not taught until the teacher thinks that the student is ready. Another reason is that in some circumstances where a Mayanist would use the word “emptiness”, a Theravadin would use the words “impermanence” or “selflessness” to mean the same thing. Another reason, in the Theravada tradition understanding emptiness is subordinated to the ultimate goal of liberation. Another view is that in advancing personal growth, it is not metaphysics but phenomenology that is required. Metaphysical views are often irrelevant, or even harmful if the intrinsic emptiness of the fruits of an unskillful act provide a rationale for performing that act. If you want to know more about the Theravada teaching, more specifically the Northern Thai Forest Tradition which is my lineage, get your hands on Thanissaro Bhikkhu’s Emptiness. 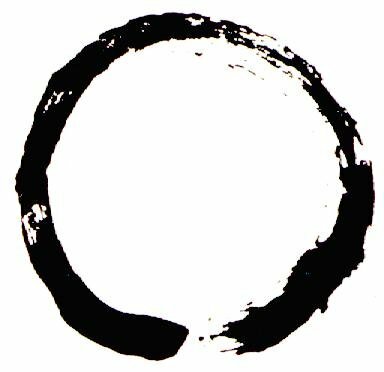 One of the most important philosophical insights in Buddhism comes from what is known as the theory of emptiness. At its heart is the deep recognition that there is a fundamental disparity between the way we perceive the world, including our own experience in it, and the way things actually are. In our day-to-day experience, we tend to relate to the world and to ourselves as if these entities possessed self-enclosed, definable, discrete and enduring reality. For instance, if we examine our own conception of selfhood, we will find that we tend to believe in the presence of an essential core to our being, which characterises our individuality and identity as a discrete ego, independent of the physical and mental elements that constitute our existence. The philosophy of emptiness reveals that this is not only a fundamental error but also the basis for attachment, clinging and the development of our numerous prejudices. According to the theory of emptiness, any belief in an objective reality grounded in the assumption of intrinsic, independent existence is simply untenable. All things and events, whether ‘material’, mental or even abstract concepts like time, are devoid of objective, independent existence. To intrinsically possess such independent existence would imply that all things and events are somehow complete unto themselves and are therefore entirely self-contained. This would mean that nothing has the capacity to interact with or exert influence on any other phenomena. But we know that there is cause and effect – turn a key in a car, the starter motor turns the engine over, spark plugs ignite and fuel begins to burn… Yet in a universe of self-contained, inherently existing things, these events could never occur! So effectively, the notion of intrinsic existence is incompatible with causation; this is because causation implies contingency and dependence, while anything that inherently existed would be immutable and self-enclosed. In the theory of emptiness, everything is argued as merely being composed of dependently related events; of continuously interacting phenomena with no fixed, immutable essence, which are themselves in dynamic and constantly changing relations. Thus, things and events are ’empty’ in that they can never possess any immutable essence, intrinsic reality or absolute ‘being’ that affords independence. I will be doing a book review of the Rebel Buddha in the next week or so, but I highly recommend this book already. It is written in an honest and accessible style, so you don’t need to have practiced meditation for a long time to get this and be able to absorb the teachings being given. I highly recommend it to everyone and hope that you will all check out the review when it is out! Freedom to Lead for Aung San Suu Kyi? I am sure that all of you have seen the good news, Aung San Suu Kyi has been released from the house arrest that she endured for 15 of the last 21 years. The pro-democracy movement in Burma is obviously very happy to have their leader released in the hopes that the struggle will garner more attention with her in the spotlight and that there might finally be a democratic society in the borders of Burma again. I must admit that I was filled with hope when I first heard that the military junta was actually going to liberate her from house arrest on November 13th, a couple of weeks after the regime had won the first “democratic” election in many years. I remembered however that this had happened before just to have her arrested and put back into house arrest (Aung San Suu Kyi has been released in the past just to be put back under house arrest by the junta shortly after), I don’t want to be a cynic but even if this will not happen again, I am wondering if she is actually free? I mean, if she was, she would be able to travel the world or the country freely; time will tell. At least her message is being heard for the first time in a long time and her plans for the future. It has already been stated that Suu Kyi will listen to the people of Burma before taking the next steps, at her headquarters in Rangoon she said that she would talk to Western countries to lift sanctions on Burma if that is what the people want. Her main message is one of hope, during her first speech she told her supporters to not lose hope and called the repressive military regime to urge freedom of speech. 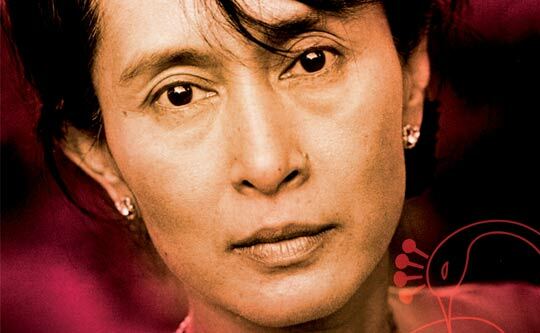 Aung San Suu Kyi said that the basis of democratic freedom is freedom of speech, seeing as how democracy is when people keep a government in check. She wants to make sure that what they do has to be done right, the people should not lose heart, there is no reason to do so, and that she wants to hear from everyone to know what should be done in Burma to help achieve this goal. Aung San Suu Kyi told the crowd that she bore no antagonism towards the people who had kept her under house arrest since 2003. 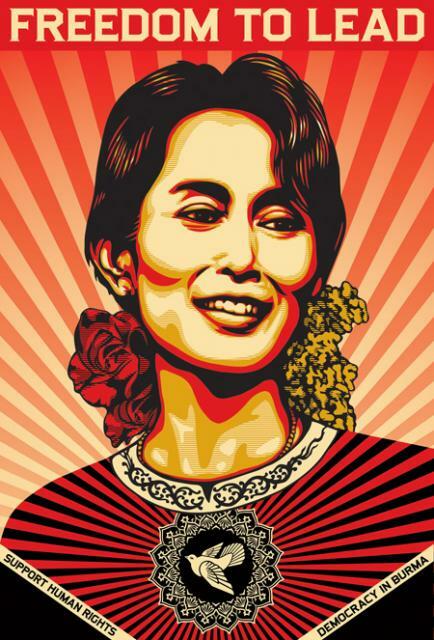 She told the crowd at her headquarters that they had to work in unison if the movement was to make any progress, this message of unity was heard over the world and support is still growing as world leaders commented on “the lady” and the pro-democracy movement in Burma. Obama told the media that she was “a personal hero of mine”, British prime minister David Cameron said that her release was “long overdue”, and French president Nicolas Sarkozy warned that any restrictions on her freedom would “constitute a new unacceptable denial of her rights”. Even though she has been sidelined and silenced by the military junta, released briefly only to be put back into confinement, for many in the impoverished country she still embodies hope of a better future. 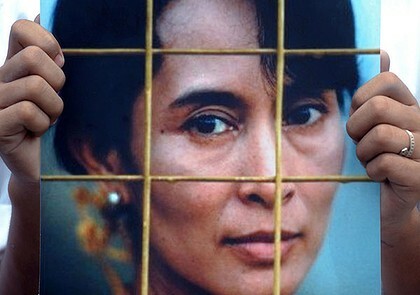 Despite the risks of opposing the military regime in a country with more than 2 2oo political prisoners, most of her supporters wore t-shirts that bore her image and that said “We stand with Aung San Suu Kyi.” Undercover police took pictures and filmed the crowd at the speech and at her home during her release. She is the most famous dissident in Burma, her house arrest was extended last year when an American reporter swam up to her lake side home, this was one of the several stretches of her term done by the junta. This last stretch caused international condemnation and kept her out of the first election in 20 years. She had swept her party to victory in elections two decades ago, but was never allowed to take power. The last election two weeks ago was boycotted by Suu Kyi’s party and was described by the West as being a sham. When she was released in 2002 she drew huge crowds wherever she went, showing that years of detention did not dim her immense popularity. There are fears that junta chief, Than Shwe, will keep putting restrictions on Aung San Suu Kyi’s freedom, his number one enemy. Suu Kyi stated that she would refuse any conditions on her release, just as in the past when she tried in vain to leave Yangon in defiance of the regime’s orders. We must remember that her struggle for her country has come with a huge personal price: her husband, British academic Michael Aris, died in 1999, and in the final stages of his battle with cancer the junta refused him a visa to see his wife. She has not seen her two sons in over a decade and has never met her grandchildren. Many see Suu Kyi’s release as an effort by the junta to tame international criticism of the last election, the first since 1990. Many Western countries and pro-democracy groups have blasted the poll as anything but free and fair following widespread reports of intimidation and fraud. Since Aung San Suu Kyi’s party disbanded before the election her role is uncertain, but I am sure that she will continue giving hope and fighting for a democratic government in the borders of Burma. Let’s hope that she will have to freedom to lead and that Burma will be able to loosen the grip of the military junta on the country and its people. This will be followed by many, making sure that her rights are not denied, and you can count on yours truly following this very closely. Like Aung San Suu Kyi said : “Please use your liberty to promote ours”. Movember, Where my Mo Bros and Mo Sistas at? Movember is an international event for a month-long event which involves the growing of mustaches during the month of November. This event is credited as having been created in 2003 by a group of Australian men, it was to raise awareness and funds for men’s health issues such as prostate cancer and depression. In 2007 events were launched in Canada, Ireland, Spain, the United Kingdom and the United States. 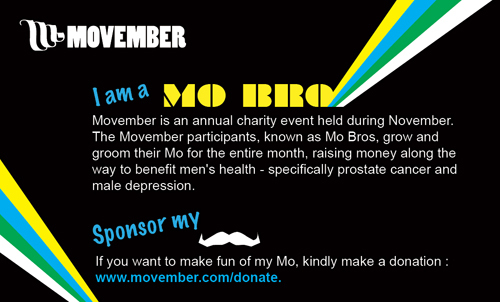 You may be wondering what exactly is a mo-bro or mo-sister, I mean this are not terms that we hear everyday. The Mo Bro is a man that is participating in the campaign and grows a mustache, the Mo Sista is a women that helps raise awareness and funds through campaigning and of course encourages her brothers to continue with their growing (or that they are simply fans of the mustache!). 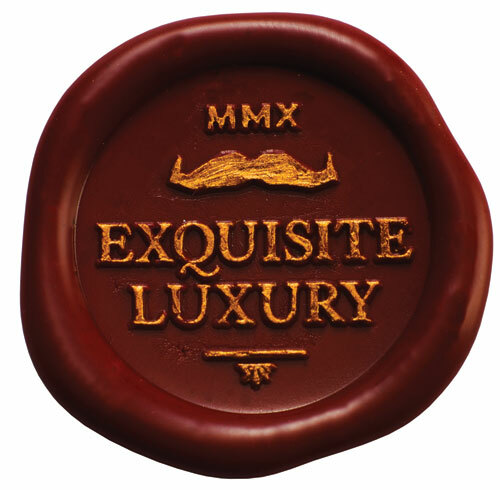 The success of Movember is directly attributed to everyone that participates in this campaign, since 2003 more than 627,000 Mo Bros and Mo Sistas who have supported the cause. The funds raised through Movember’s Canadian campaign go directly to Prostate Cancer Canada which enables them to fund vital research that will led to better screening tests and treatment options and to run support services for men surviving prostate cancer. The other significant outcome of the Movember campaign is the awareness of prostate cancer and our men’s health messages we are collectively generating. Men of all ages are not only listening, they are acting on this messaging and taking positive action with their own health, diet, exercise and lifestyle. We recently surveyed the Movember community and found that because of their involvement in Movember, 39% of the Mo Bros sought medical advice, whilst a further 36% encouraged someone else to seek medical advice. The 2009 campaign had 255 755 mo bros and mo sistas that participated, there were also one million donors who raised $47 Million for Movember’s global beneficiary partners. Canada’s campaign was the second largest in the world, behind Australia (the birthplace of the movember campaign), there were 35 156 Mo Bros and Mo Sistas that raised $7.8 million for Prostate Cancer Canada. Lets see if we can beat this with the 2010 campaign. Grow a mustache for a good cause, have fun with it, grow that mustache that you have always wanted to try out! 4 400 men will die of prostate cancer this year in Canada, I think that it is time that we get together to try and find a cure, and also encourage people to get tested. Also, lets not forget to have fun while doing this! I am looking forward to the month ahead and hope that I will be able to raise funds and awareness for this cause that touches us all. You can donate to my team on the Movember website, the team is MouAA Quebec, it is a work group that I got organized! Support the men in your life as they grow whiskers for the fight against cancer!